Habitat: Nettle is very abundant, and can be found in most of Europe, Asia and North America. It prefers rich and dump soil, and can grow in open woods and meadows, as well as in disturbed areas-along roadsides and barnyards. Description: Common Nettle is a herbaceous, perennial plant. It grows up to 2 meters in height. It has widely spreading yellow roots, wiry green stem and soft green leaves. Leaves are oppositely arranged along the stem, coarsely toothed and hairy. Hairs are released when the plant comes in contact with the skin, producing stinging sensation. Flowers are small and green or brown in color, formed in dense clusters. Useful components: Acetylcholine, albumen, choline, gum, iron, histamine, starch, sugar, serotonin, resins, oleanol acid, sterols and steryl glycosides. 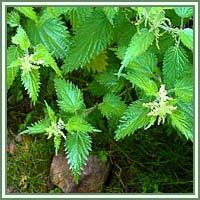 Medicinal use: Nettle has been used as a medicinal plant for centuries. 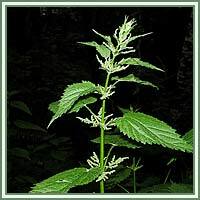 Traditionally, nettle was used in treatment of muscle and joint pains, arthritis, anemia, gout and eczema. Nowadays, Nettle is mainly used in relieving the symptoms of benign prostatic hyperplasia. Applied topically, leaves can relieve joint pain and can therefore be useful in treatment of osteoarthritis. Due to high contents of iron, Nettle can be used as a herbal remedy against anemia. It is also used in treatment of sinusitis, rhinitis, alopecia, and various skin disorders (such as eczema). It is sometimes recommended against heavy menstrual bleeding.